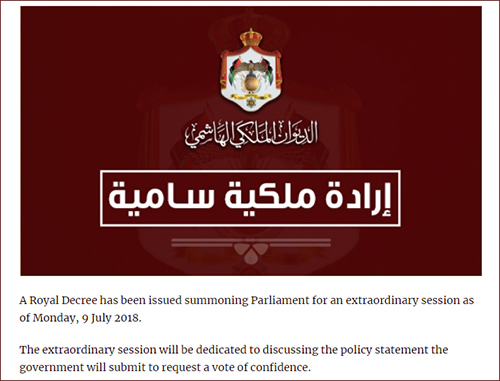 Speaker of the House of Representatives, Atef Tarawneh, summoned the Parliament with a Council meeting on Monday, June 9, 2018 where the Prime Minister, Omar Razzaz, is to deliver a statement regarding his newly formed government. Members of the Parliament are to discuss the government’s statement and cast a ‘vote of confidence’ following the hearing. Razzaz and his Cabinet took the oath of office on June 5, 2018, after the resignation of the government of Hani Mulki, which had resigned after Jordanians suffering from failing economic policies, unemployment and prices hikes organised a wave of anti-austerity protests.